Date : 9 July, 2002. 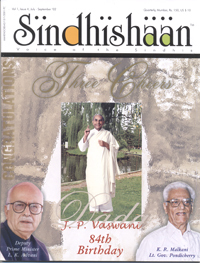 Your esteemed journal ‘Sindhishaan’ Vol. I Issue 3 – April – June 2002, is a real beautiful book, well documented, decent and decorative indeed. The articles are superb, especially “Descending of the Divine” by Dr. Motilal Jotwani and “English connection to the Sindhi language” by Dr. Baldev Matlani, are informative and educative. “Packed with a powerful punch — Popati Hiranandani – An epitome of courage” by Sundar Iyer is the best. She is a living legend of Sindhi literature. She is a research scholar, one of the original writer par excellence indeed. Kindly accept my heartiest Congratulations and good wishes for publishing such a journal of National and International standard. The printing, the paper, photographs, the material printed is fine, worth reading and worth presenting as a ready reckoner for ready reference on Sindhiat. Lastly I liked the article “An Honest Viewpoint” by your sweet son Amit Butani – Congrats ! Hats off to you.